I think it’s fascinating to see the degree to which different kinds of artists are inspired by music. In literature, poems like T.S. Eliot’s Four Quartets, techniques like the sprung rhythm in Victorian poet’s Gerard Manley Hopkins’s sonnets, or the novella The Kreutzer Sonata by Leo Tolstoy are testament to that fact. But what about visual art? We’ve already seen in John Cage’s Notations that the visual element can be an important aspect in these composers’ attempts to represent sound. It’s equally fascinating to see how various visual artists were likewise inspired by music. 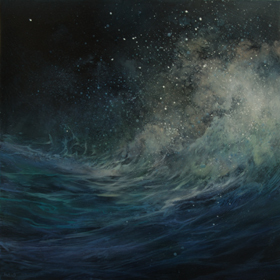 Teri Malo is a painter based in Boston, Massachusetts, and a constant commenter and visitor to the blog. Upon seeing the lovely paintings on her blog, I noticed that a recurrent theme of Teri’s paintings is the relationship of visual art to music, and how certain qualities of music (tonal areas, forms) corresponds to qualities in a painting. 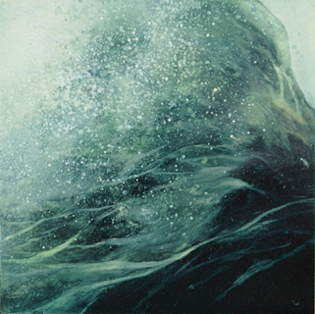 Another interest of hers is water, from her Land and Sea paintings to her Pond series and, most interesting to me as a musician, her Water Music series, which explores how the ocean, a painting, and music could be related. In the ongoing Water Music Series, I started by painting waves and the sea, but quickly found that the relationship between the movement of water and rhythms in music, especially the music of Philip Glass, haunted me. Some of the paintings are concerned with rhythm, some are more about color – all are about creating harmonious environments. What is great about her blog is that she includes a paragraph about “painting techniques” at the end of many posts, giving the background for each painting, or how something about music informed her approach. Granted, I am not a painter or a visual artist of any kind, so I appreciate the opportunity to learn more about the subtleties that went into the work. For instance, in Song in a Key for Lucent Green, she looks at how “the purity, or saturation, of a color influences its impact.” Granted, many may think that it is a little odd to call something that is not music to be in a “key” and seems at first glance to be an overreaching for a musical context. This is especially true in literature, where it’s hard to relate words to tonal areas. However, in paintings, I think it can works. Teri explains how the color is something like the key of a piece — it affects how we perceive the piece and colors our emotional perception of it. The piece, of light penetrating the surface to the bottom, along with the downward thrust of the wave, is informed by the green, a dark, almost unusual green to which the eye is drawn. It’s also fascinating how this “green” is developed. There are little splotches of yellow on the bottom, darker greens, maybe a little bit of aquamarine, white, and the tiny details of all the little bubbles. These different elements all contribute to our impression of the overall picture, not to mention the “lucent,” or luminous quality of the painting. In the same way, the tonality of a piece, or lack of it, can inform our understanding and emotional reaction to it. Water Music – On the Dispersal of Notes is more abstract. The painting looks at the subtlety of notes, and wonders where notes go when they leave their staffs. Notes float away from their point of origin, but the keystroke can whisper, echo for a long time, and leave a trail of muted colors and nuances of feeling. Another interesting series within the Water Music series is the Crescendos portfolio. These are investigations into the energy of a wave and its movement. The titling doesn’t necessarily have to be an explicit theoretical relation of music to water, but I think it is a good title for something that is a natural progression both in music and in the build up, crash, and descent of a wave. 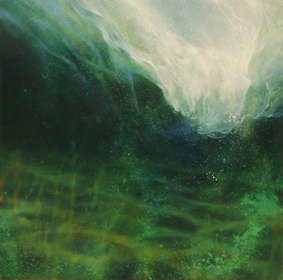 I think these paintings are especially lovely, and Teri is very skilled at capturing the nuances of a wave suspended in the moment of release: the minuscule water droplets in the spray, the color of the wave at its peak, the silky texture of the water, and the movement of the currents underneath. What ultimately comes through is that there can be something deeply musical in the rhythms of nature; in the graceful rhythmic push and pull near the shoreline, or in the more unpredictable wildness of a storm, and I think that Teri gives her viewers a nuanced look at the relationship between both. 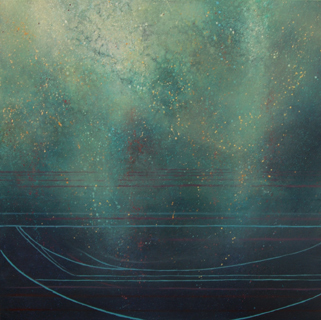 Teri also has a new exhibition entitled Along the Blue Margins that is opening at Arden Gallery on June 5, 2012! It will run through June 30. The location is 129 Newbury Street in Boston, Massachusetts for anyone that’s interested. I also recommend readers to check out the rest of the paintings on her blog, which has many more paintings of the same type, as well as information about open studios and exhibitions. *Pictures are used with the artist’s permission. Wonderful paintings! Music and art; two sides of the the same coin.